Over the last few weeks some of Germany’s most renowned politicians came to California to get together with the great minds send out from Germany. Mostafa Akbari, CEO of bitstars, who is currently situated in Silicon Valley (Palo Alto/San Francisco, California, USA) to establish a market with the US and Asia, met with them personally to discuss the technology of tomorrow. No matter whether it is the CDU, SPD or Bündnis 90/Die Grünen party, all came to talk about differences in the start-up culture in Germany and the US, the relevance of Industry 4.0 as well as the open-mindedness of the Silicon Valley and Japan towards start-ups. 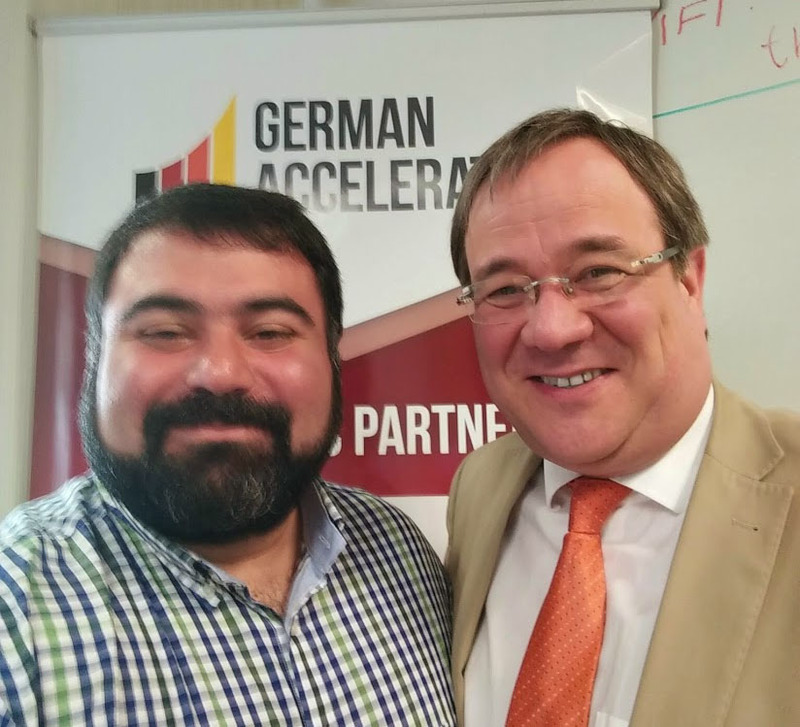 bitstars CEO Mostafa Akbari met with Armin Laschet (CDU), currently serving as state MP in the Landtag of North Rhine-Westphalia as head of his party’s parliamentary group. They discoursed about the major differences of the support for founders in Germany and the US, what Germany can learn from the American founders’ mentality and how the founders’ climate could be improved altogether. Read more about this visit online (German press). Mostafa Akbari meeting Armin Laschet (CDU). Furthermore, Mostafa came together with Brigitte Zypries (SPD), current Parliamentary State Secretary at the Federal Ministry for Economic Affairs and Energy coordinating Germany’s IT, aviation and space policies, to debate about the potential and future of Industry 4.0. Main topics were Googles new project Jaguar, introducing smart textile designs in cooperation with the textile industry, as well as the role of other Silicon Valley pioneers and their impact on mid-tier companies. In the context of Industry 4.0 the importance of German founders was further elaborated. 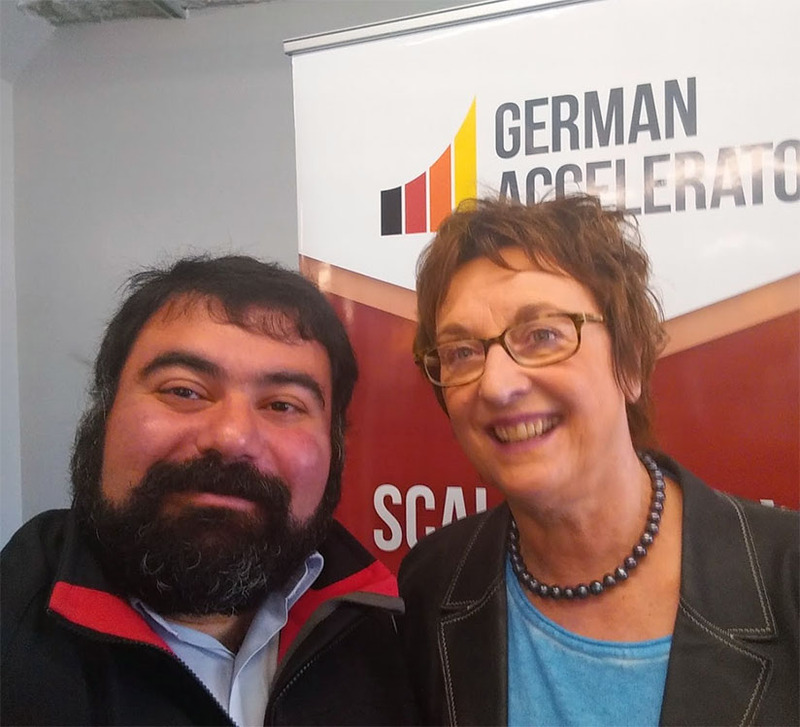 Mostafa and Brigitte Zypries (SPD) at the German Accelerator. Last but not least, Mostafa met with Cem Özdemir, co-chairman of the political party Bündnis 90/Die Grünen. They discussed the actual technological, economic-political state in the US and Japan. The focus of the conversation was set on the positive attitude of the Silicon Valley as well as the open minded mentality of Japanese companies towards startups around the world. 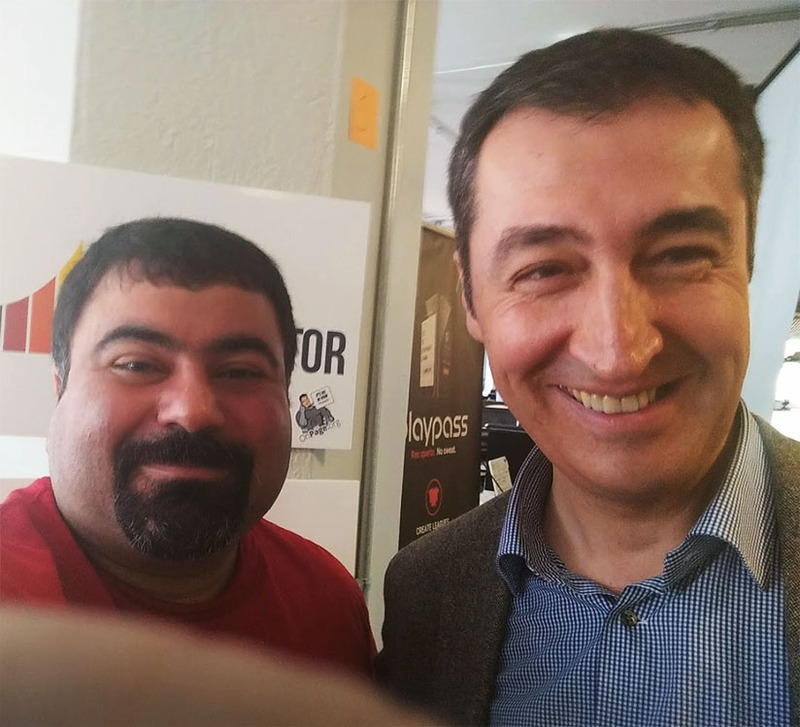 bitstars CEO Mostafa Akbari meets with politician Cem Özdemir (Bündnis 90/Die Grünen). Those meetings underline the commitment and involvement of German politicians to support German technology as well as ambitioned entrepreneurs abroad. CEO Mostafa Akbari and CTO Simon Heinen were among thousands of tech-professionals participating in over 20 workshops, 200 interactive demos and 100 first-class talks from industry leaders and pioneers. Simon Heinen elaborated on the topic of the IoT and AR in a talk about ‘The perfect match: Augmented Reality + M2M Communication’. Mostafa Akbari, who has a lot of real-world implementation experience, met consumers and providers alike to discuss the practicalities of ‘How to Expand AR Adoption in Enterprises’ in a moderated panel. The whole discussion is available on YouTube. A spontaneous talk about safety precaution in working environments as well as the potential and advantages of new AR goggles completed the event for us. Panel moderated by Alex Hill (CN2) with Juergen Lumeira (Bosch), Paul Davies (Boeing), Fridolin Wild (DDR), Mostafa Akbari (Founder & CEO, bitstars), Joe Metzger (Johnson and Johnson). A discussion forum on augmented reality advocating the alliance of enterprises. Main issue is the promotion of the expansion of enterprise AR and the adaption to open and interoperable standards. To summarize, it was a great event that provided an interesting impression of the current state of the AR and VR business, combined with great opportunities to meet amazing industry experts and a perfect mix of various events and activities. bitstars is looking forward to next year, for which the registration is already open! Our free, web-based tool holobuilder.com can become your new home for creative Virtual and Augmented Reality content creations. The holobuilder Editor runs directly in your browser, enabling you to create great 3D content for AR and VR for free. holobuilder lets you create great 3D content for AR and VR for free (as seen in our video)! It is a simple and powerful platform that lets you create 360° presentations from photospheres as well. Build your own virtual reality by interlinking your spheres and adding fantastic 3D models. Share your projects with the World or embed them right into your website. With the Google Cardboard viewer, the Player App from Google Play or directly from holobuilder. It is the simplest way to build your own VR experience. As a start-up company at bitstars we are flexible enough to realize almost any special requirements, just drop us an E-Mail! Create a virtual reality using your own photospheres and 3D models. Use your projects everywhere with HoloPlayer. Quick results with ready-to-use projects and 3D models. So stop wasting valuable time being bothered by Apple’s latest buy of Metaio and start creating using holobuilder.com. The new magazine for small and medium-sized businesses „macher und gestalter“ by the ZEIT publishing group focuses on the „big issues“ German small and medium-sized businesses are facing today. How to face the ongoing digitization? How to tackle the demographic change? How to manage questions of financing and succession? Besides a very interesting article about smart factories the magazine published a short interview with our CEO Mostafa Akbari. Check out bitstars HoloBuilder platform here. Silicon Valley – unser Abenteuer beginnt! kurzer Reisebericht: Silicon Valley – unser Abenteuer beginnt! Der Weg von Aachen nach Palo Alto (Silicon Valley) ist lang und abwechslungsreich. Ein paar Eindrücke wollen wir euch in diesem Blogartikel zusammen stellen. Bereits in der Früh um 07:15 Uhr startete Mostafa Akbari für bitstars mit dem Taxi bei kalten 2°C (35,6°F) zum Aachener Hauptbahnhof. Von dort aus ging es mit dem Zug, wie viele weitere Pendler nach Frankfurt/Flughafen. Mit einer Verspätung von 90 min ging es von Frankfurt/Flughafen weiter mit dem Flugzeug nach San Francisco (Ankunft-Ortszeit: 5:30 PM). Silicon Valley rückt damit um ein ganzes Stück näher! Spätestens jetzt wurde das Abenteuer „Silicon Valley“ real! Der Flug allein wird jedoch noch etwa 11 h Stunden ohne Unterbrechung andauern. Nachdem Mostafa den Flughafen in San Francisco endlich nach einiger Wartezeit verlassen konnte, wurde auch hier wieder der Weg von San Francisco nach Palo Alto wieder auf Schienen zurückgelegt. Nach knapp 24 h Reisezeit erreicht Mostafa sein Ziel. Vor Ort wird Mostafa von warmen 16°C (60,8°F) Sonnenstrahlen und einem blauen Himmel begrüßt. Das Silicon Valley erstrahlt im schönsten Gewand! So lassen sich nach der langen Reisezeit die letzten Meter auch noch zu Fuß zurücklegen. Müde, aber ohne große Probleme wird Mostafa Akbari von seinem Gastgeber empfangen. Im Holobuilder von bitstars haben wir für euch ein paar Eindrücke festgehalten. Um die lange Wartezeit zu überbrücken und sich auf den Ort einzustimmen, empfiehlt der Gründer von bitstars Interessierten das Hörspiel „Silicon Valley: Was aus dem mächtigsten Tal auf uns zukommt“ von Christoph Keese (Twitteraccount). Eine kleine Leseprobe stellt Keese auf seiner Website zur Verfügung. Der Journalist und Wirtschaftswissenschaftler Christoph Keese arbeitete 2013 ein halbes Jahr lang im Silicon Valley. Dort traf er Erfinder, Gründer, Wagniskapitalgeber und Professoren in Stanford und Berkeley – auf der Suche nach Erfolgsmustern und Treibern der boomenden Internetwirtschaft. Holoplayer: Silicon Valley – unser Abenteuer beginnt! Im Holoplayer könnt ihr Mostafa auf einem Teil seines Weges begleiten. Das Laden der Einbindung kann auf verschiedenen Browsern etwas dauern (optimiert für Google Chrome). Navigiert über die Pfeile. bitstars is listed as one of the first IT StartUps in North Rhine-Westphalia (NRW). NRW is building their new profile as home of IT and Engineering Startups. Find bitstars profile and an interview with the founders in german here.